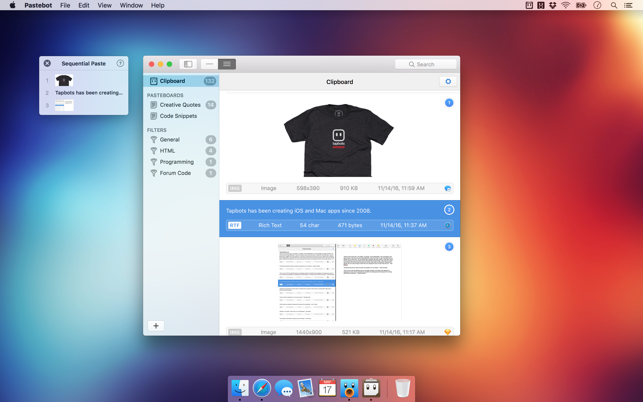 If copy & paste is a part of your workflow, Pastebot is an indispensible tool to improve your productivity. Quickly recall clippings that you have copied before and apply powerful text filters to format before pasting. You can even queue up multiple copies to paste in sequence. Pastebot is always running and only a keyboard shortcut away to command copy & paste. 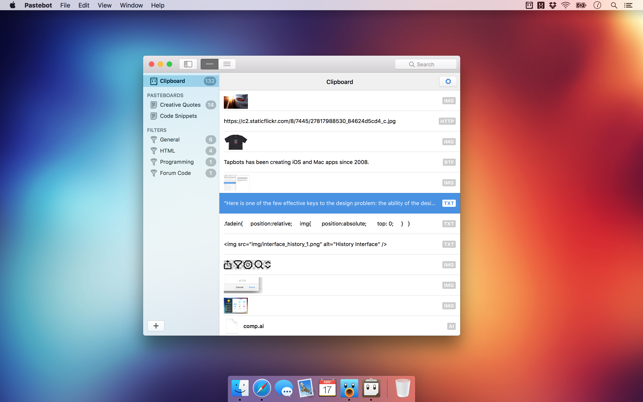 Pastebot saves everything you copy so that you can quickly recall them in the future. Save and organize frequently-used clippings into custom pasteboards and create keyboard shortcuts to access pasteboards and paste specific clippings. Build powerful filters with a live preview and apply them as you paste. Create keyboard shortcuts to quickly paste using your filters and export your filters to share with other Pastebot users. Pastebot is there when you need it and invisible when you don’t. Quickly access your clippings from any app and search, preview, or filter clippings before pasting. You can even set the order of clippings to paste in sequence. With iCloud enabled, your main clipboard, custom pasteboards and filters sync across all of your computers running Pastebot. Your clipboard and filters will be on every mac you work on. Create custom pasteboard groups to organize important clippings you want to save and re-use. Assign keyboard shortcuts to clippings you use most often. macOS Sierra’s Universal Clipboard works alongside Pastebot. Copy a clipping in Pastebot and paste it on your iOS device via Universal Clipboard. 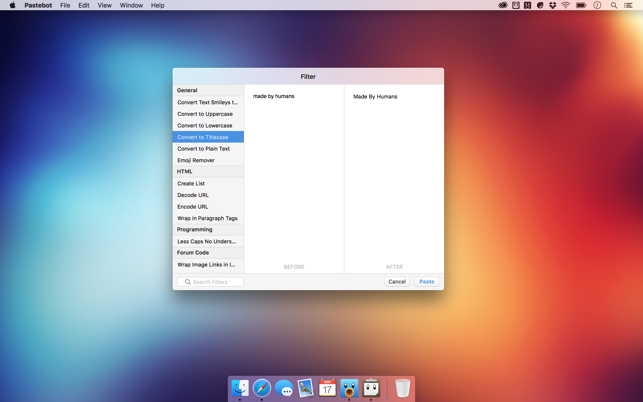 Pastebot works in full-screen and split-screen mode. Running in split-screen mode allows you to use Pastebot as a scratch pad. Choose from various quick paste window styles to suit your preferences, always paste in plain text, enable release-to-paste and more. 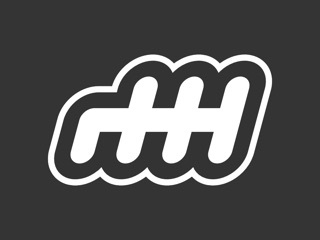 There are apps you copy from that you never want stored in Pastebot. Just add that application to the blacklist and Pastebot will ignore it. 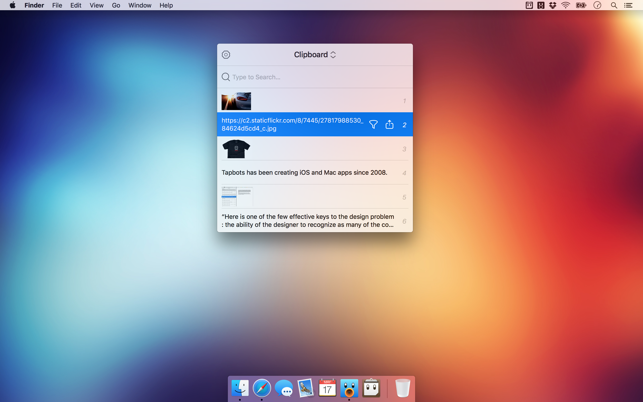 Find a clipping quickly with Pastebot’s powerful search capabilities. Search based on content or metadata. You can search by application, date, data type and more. 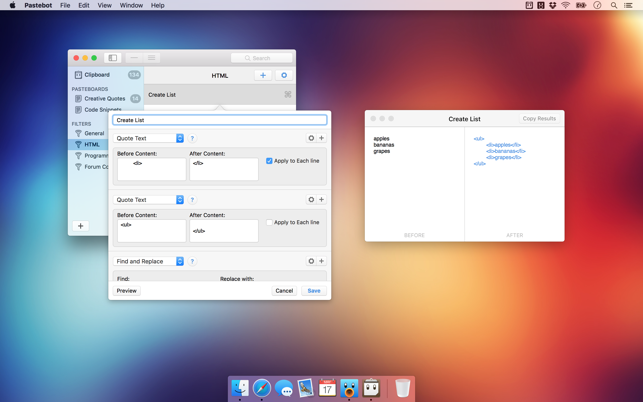 Pastebot features many keyboard shortcuts to satisfy any copy & paste maestro. Paste the previous item on the clipboard or paste the current clipping while applying the last used filter. I LOVE pastebot. Does seem to work with Microsoft Office! I can barely remember what it was like to live without pastebot. I… Somehow got my work done, but I think I was constantly copying and pasting into temporary text files to keep the snippets I needed, and I kept saving things in random files… It was terrible. Pastebot is one of my favorite things about the Mac, and I’m glad it’s being featured, and having used it, I’d happily buy it again. I did have some issues with it interacting with Microsoft Office products on the mac (Using Office 365) but I don’t remember exactly what was going wrong. Upong seeing those comments here, I retried, an it worked perfectly. To be clear, I had Pastebot running BEFORE I launched any of the Office products, and that might make a difference. It also might help that I recently restarted. I’m retaining the copy of my original review as the below problems might be something other users are seeing. After speaking with Pastebot support, uninstalling and reinstalling and making sure “Install Paste Script” was no longer present under ‘File’ in the app’s menu fixed the problems. I deal with several little snippets of text day in and day out and this app has made my life so much easier. Want to start off by saying that I love this app and its design. It has worked flawlessly until recently. My primary problem is losing items in custom pasteboards. What typically happens is when I copy and paste from a custom pasteboard, that item is somehow deleted from that pasteboard at some point between the time I copy it and the next time I open the pasteboard. Have uninstalled and reinstalled to no avail. Another issue I’ve been having on one of my Macs (a 2012 Pro) is that items aren’t automatically pasted when selected from a pasteboard. I hear the Mac’s “bonk” signifying an error before having to paste the item myself. Will update to 5 stars once these problems are fixed. Best Clipbboard app hands down! I have used clipboard managment programs for years. I’ve tried many and this one is the one to buy. The Mac never has had a good clipboard app from my experience but the ones I did use got me by. THIS one with it’s sequential paste is so awesome, it’s made filling in my database work a breeze. I even made the help page my home page so I’m reminded to check out features. I’ve NEVER done that for any application I can recall. Search clips everything stays in sync so if you copy something on you home work MAC and later need that clip on your Macbook in the bedroom….viola…there it is!